Michael Buerk travels Britain to explore the innovations of the Victorian age. Cotton’s place at the heart of mass production is examined, via the creation of the first inter-city railway, a game-changing industrial loom and the birth of the Manchester Ship Canal. Series in which Paul Murton takes a tour of Scotland’s lochs. In this edition, Paul travels from Britain’s most westerly mainland point to a place once guarded by an ancient Celtic goddess. On the way he discovers how the ancient oak woods of Loch Sunart were once a hive of industry, then goes deep underground to discover how 18th-century miners named a new element. On the shores of Loch Linnhe, he meets the owner of a castle and recreates a scene from Monty Python’s Holy Grail, before ending his grand tour from the heights of the pap of Glencoe. Behind-the-scenes documentary series about one of the UK’s busiest transport hubs and the western rail network it serves. A heatwave hits the network hard, with signalling equipment out at Didcot, rails in need of stretching in London, and a surfeit of insects overworking trains’ windscreen wipers. Documentary following the men and women of the Royal National Lifeboat Institution (RNLI). On the north coast of Kent, new crew member Ruth is on board for one of her first ever shouts – a member of the public has spotted what looks like an upturned boat out at sea. Harry and Briony Anscombe have made a radical change to their lives, moving with their three young children from London to Cornwall – and setting up an outpost of their media business at the same time. It’s a bold attempt to emulate the positive work-life balance and lifestyle they experienced in California. But even bolder is the giant five-bedroom house they want to build, heavily inspired by an American modernist house Harry saw in the 80s teen comedy Ferris Bueller’s Day Off. All floating steel and glass, Harry by his own admission has become ‘obsessed’ with living somewhere just like it. But creating such an architecturally ambitious home would typically cost over a million pounds, and Harry and Briony have just £400,000 to play with. Travelogue series into the notably private nation. 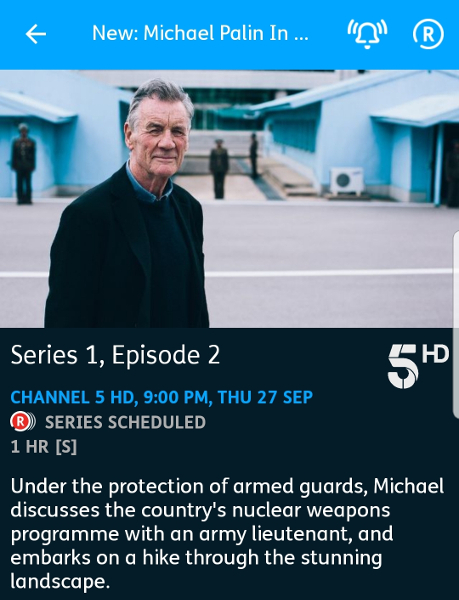 Under the protection of armed guards, Michael discusses the country’s nuclear weapons programme with an army lieutenant, visits a massive tourist resort being constructed on the beach, and embarks on a hike through the stunning landscape. Rob Bell explores the lost landscapes and infrastructure of some of Britain’s former railway lines. Beginning in the famous steel town of Sheffield, Rob follows the line over the bleak Pennines, discovering a miniature railway in Wortley and the record-breaking Woodhead Tunnel, before landing in the industrial powerhouse of Manchester.